The Rack Segment was first announced in the January 1921 Meccano Magazine, although we can probably be sure that it was available before that date as most Meccano Magazine announcements were several months late. It didn't find its way into outfits until late in 1924, when four were included in the largest outfit 7. These continued into outfit L, and one was included in the pre-war outfit 10. 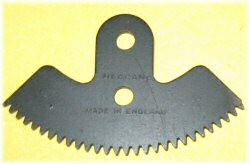 Four of these segments make up a 3 inch diameter gear, which is a very odd size for Meccano, although it should be remembered that at the time of its introduction the largest gear was the 1½'' 56-tooth gear (the 3½'' gear didn't arrive until 1924). If it were to be at 38dp (like the majority of gears were), this would make 114 teeth, and therefore 28½ per segment. In fact, rack segments seem to be quite variable in their design, but the majority of the examples seen are cut just after the point of the 'end' tooth. This means that they won't fit together snugly, and if you attempt to make a complete wheel you need to be prepared to try different rack segments, and tweak their spacing within the tolerances of the holes to allow the teeth to line up well. You can very occasionally end up with 115 or 116 teeth this way. The photo to the left shows how variable the ends can be – the join on the left is good, but the join on the right is terrible and needs opening up in order to avoid jamming. Fortunately, only one rack segment is needed for most applications. It is often thought that the part was dropped at the close of production in 1941, but in fact it did reappear for a time in blackened steel (stamped Meccano Made in England). It appears in the parts listing on the back of the manuals between 1945 and 1952 as either "Toothed segment" or "Toothed segments". It is missing from the 1953 manuals, which counts as quietly dropping the part, I suppose. Although it has been suggested that very early 10 outfits contained the toothed segment, no examples have yet been found. The 1949 manual for outfit 10 was a close copy of the pre-war manuals, and still had the cross-hatching on the photographs. Model 10.13 "Ambulance" calls for this part as the steering rack. Here's a rare and interesting bit of paperwork. The letter to the right (click on the picture to enlarge it) is from Meccano Ltd, dated 23rd August 1953, explaining that "The contents of Outfit No.10 were changed when production was resumed after the war and the Toothed Segment included in the pre-war Outfits was withdrawn...". The recipient had complained that his 9a outfit didn't include part 129. So we can be fairly sure that the outfits didn't have them, but we also can't find any reference to part 129 as a spare part. The last known mention of it being available is in the Australian price list of August 1942 (at 15/5 per dozen). Post-war price lists of June 1950 show it as "not yet available", and yet in the next price list in October 1950 the part has disappeared. We haven't yet found a dealer pack of these, and so black rack segments are a bit of a mystery. If you know something, please tell us! John Nuttall, our resident Meccano Magazine scrutineer, has spotted this article in the February 1950 Meccano Magazine, in which there is an updated version of "How to use Meccano Parts" for the Toothed Segment. 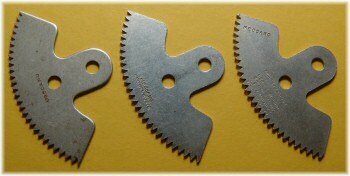 In three separate pictures, two shown to the right, the toothed segments are clearly black rather than nickel plated. So, although they were advertised as "not yet available", they certainly existed at this time, at least in the model room. I have checked two separate 1939 outfit 10s of reasonably good provenance, and both of them contain nickel-plated Rack Segments, with the stampings Meccano and Reg. No. 680416. This proves that the nickel ones were certainly current at that date. Rack segments can be dated to some extent by examining the stamping of the parts very early ones have only the Meccano stamp, with the MFEA being added for the majority of the 1920s. As very low volume parts, however, it is unwise to rely on these stampings, as Meccano may have had several years' supply of them in stock at any one time. These are certainly rare, but should be out there somewhere. Does anyone have a picture? Post-war 'toothed segments' as spare parts would appear wrapped in brown paper, I should imagine. I have a number of very thin segments (ca. 1/16" thick) stamped Meccano, they are poorly plated with the nickel skin lifting and a lot of rust too. I assumed them to be WW1 economy production items, but if these weren't produced until 1921 what would their history be? 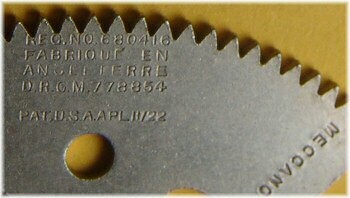 FYI I also have some 50 and 56 tooth gears made of steel with similar guage metal for the disk. Presumably these are later than WW1 too. Have you noticed the photo of the rack segment meshing with the 1" spur gear part 31 will create an intermittent mechanism as the pivot point is one hole too far from the true centre. It will not rotate for 90 Degrees fully meshed. does anybody know more ? I've built the ambulance about six months ago. I used a toothed segment because I had one and thought any substitution would have been difficult. This model has always 'concerned' me. It is easily possible within the compass of the set to fit geerbox, transmission and differential. Why is it so mechanistically simple? My cousin was given a 10 set in 1952. This contained a nickel toothed segment in a transparent envelope, and a No2 clockwork and an E120 electric motor, in boxes outside the set.We suspect that the shop (the now defunct Shaddicks, Gravesend) had some pre-war stock, and made the post-war set up to pre-war contents. Very interesting letter, thank you. Although it is difficult to make out the words, it would appear that the letter states that the withdrawn part 129 had been "replaced with other parts". Does anybody know what parts these might have been? The sketch of the suggested alteration regarding the ambulance model makes sense and one can see why it may not have been considered worthwhile to continue this part on the basis of one model, particularly where adaptation to a common part was a straightforward matter. It is a pity, however, that the segment did not remain as a spare part. Reply: I think that "replaced with other parts" is marketing speak for "we consider adding a few bolts and strip couplings a fair swap for all the parts and the three motors we took out". I haven't made the ambulance, but it would seem at first glance that there could be an issue with the steering being geared so much higher with the suggested sketch. But perhaps it would work. Has anyone out there built the Ambulance recently? Yes. The stringing part is an important piece of evidence which points to there being two bevels in this outfit. I am now going to check all my stringing cards for any other anomalies. I can hardly contain the excitement. It beats going to the football every time!